Colin Angle is a pretty big name in the world of robotics. His company, iRobot, is one of the foremost military contractors in the world, though it's better known as the designer of the Roomba - the first ever robot vacuum cleaner. Basically, when it comes to robots, he sort of knows what he's talking about. And right now, what he's talking about is how progress in the field of robotics is dragging. "We are just about none of the way to where we need to be to create a robot industry that is understood as a robot industry and not an interesting adjunct to another industry," Angle explained in an interview with Computer World last week. "Here we are," he continued. "iRobot is just entering its twenty-fifth year. I think I would have expected a lot more diversity of robots in the marketplace that I could go buy that would do some real stuff. Twenty-five years has passed since we started and we've accomplished...I won't say nothing; we're starting to see the next generation of manufacturing robots, but that's still relatively early. That's not very blue sky." Even though robotics technology is growing steadily more sophisticated, Angle says, the problem is that the industry is still rife with dreamers who are wasting "hundreds of millions of dollars building cool demos instead of useful products in the robot space." 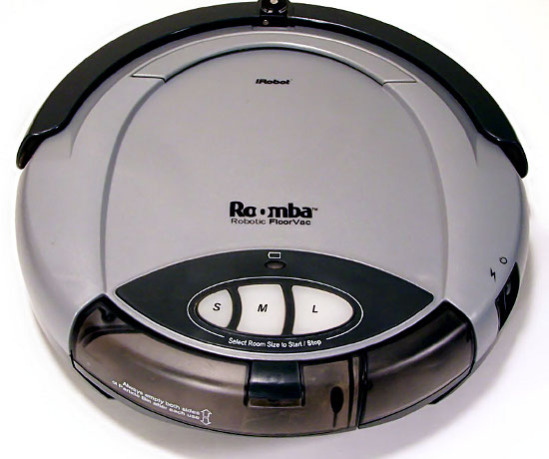 To drive home his point, he talked about iRobot's design decisions with the Roomba - then pointed to Sony's Aibo robotsas an example of the sort of thinking that drives people out of businses. "We could have built a robot that could climb stairs because it's super cool, but we would have gone out of business. Look at Aibo. It cost [Sony] huge amounts of money every year to continue to advance the robot. They may have created valuable PR and marketing events to enhance the reputation of the builder, but they didn't advance the robot industry." That's the biggest issue - graduates everywhere are springing for the cool, the awesome, the sci-fi...without thinking about whether or not any of what they're doing has any practical use. Although some universities do require robotics graduates to take courses in entrepreneurship to stem the tide of wistful thinking, there's still plenty of stargazers without a whole lot of purpose to their inventions besides looking awesome. It's not just a lack of practicality that's stymying meaningful development, either. "It takes $20 million or more to build a legitimate robot. It's a much bigger check to write to get to play," explained Angle. "It's expensive to do what we're doing.... If it takes $20 million to build a legitimate robot, where do you find that as a startup? You need someone to take such a big bet." Though Angle may be annoyed, he's not entirely pessimistic. The advances, he admits, are coming - even if they're doing so with a painstaking slowness. Companies like Google are leading the charge with self-driving cars and delivery drones, while the militaries of the world are hard at work testing autonomous combat platforms. "Things are absolutely changing," he added. "It'll still be maddeningly slow, but it's accelerating."